When I go to the theatre, more often than not I see something classical: a play where the characters speak poetry rather than prose, usually in iambic pentameter. There is a clear division between the real world and the fictional world on stage, no matter how good the actors are. Not so here. 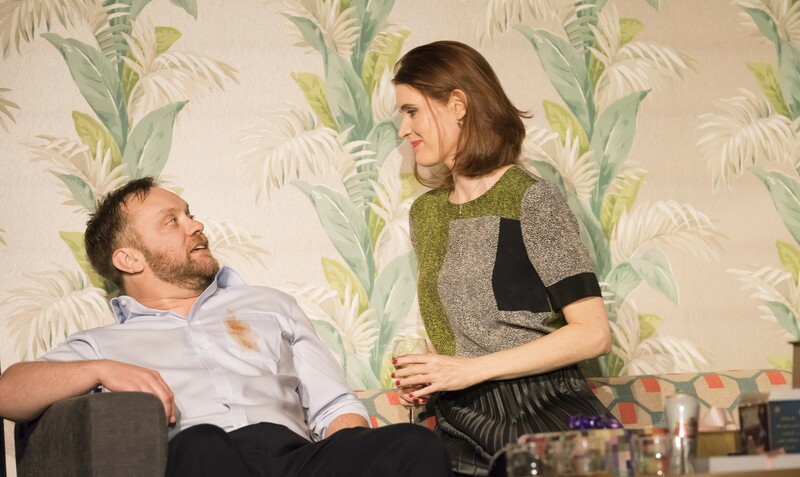 For my birthday, J nudged me out of my comfort zone by taking me to David Eldridge’s play, which has already enjoyed great critical success at the National Theatre, and made its West End transfer to the Ambassador’s Theatre in mid-January. Wow. This wasn’t theatre: this was life, flayed and placed under the microscope. With no interval and only two actors, it’s probing, insightful and frequently excruciating: a merciless, yet strangely tender exposé of modern romance. Laura (Justine Mitchell) has just moved into a new flat in Crouch End. 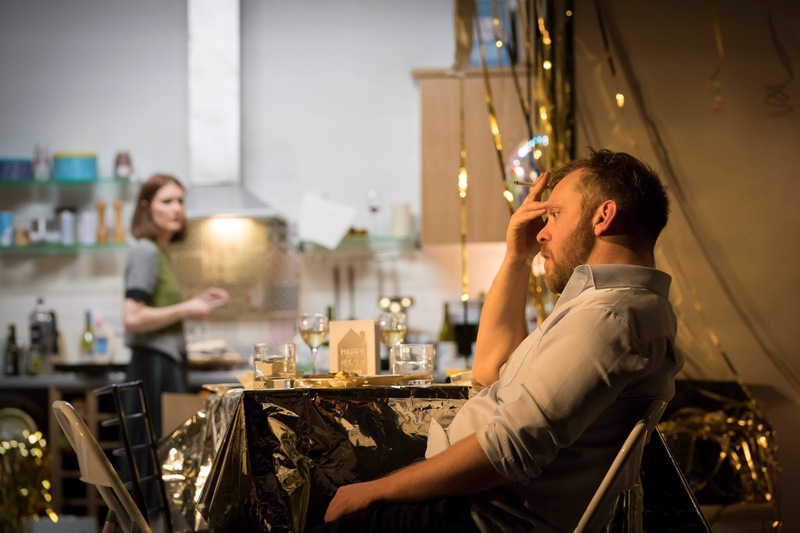 As the last guests leave after her housewarming party, one man hangs back amid the dirty glasses and half-eaten bowls of crisps: Danny (Sam Troughton). He and Laura have been eyeing each other up all evening, but he’s not quite sure what to do now. He’s missed the last taxi by impulse or design, but he’s still not fully committed to staying. Laura herself is prepared to be the emancipated modern woman and to take the lead, but her advances meet a confused response. What’s she supposed to do? This was meant to be a quick, ego-boosting fling, but as the evening wears on, in real time, both Laura and Danny find themselves opening up far more than either of them intended. The script is so natural, and performed so intuitively by the two actors, that I genuinely forgot I was listening to something that had been written. Everything feels like a natural progression. And it all feels so painfully real. Laura, in her late thirties, and Danny, in his early forties, are immensely relatable. They’re still young, but their world has begun to close off opportunities of meeting others: as their friends pair off, and their own baggage begins to weigh them down, despair creeps in. You get the feeling that both of them would love to be able to fall into bed, no strings attached, but as the play progresses, you realise that that’s not really what either of them wants. For better or for worse, each of them is crying out for an emotional connection which, for very different reasons, they don’t expect to find. To simply scratch the surface of their bravado is to unleash a horde of insecurities, fears and anxious hopes that both have been trying to hide. Initially I found Mitchell’s Laura the less sympathetic character of the two, but I rapidly revised that. At first she seems exactly as Danny sees her: professionally successful, sexually confident, outspoken and slightly predatory. But beneath the mask there’s a brittle, anxious and bitterly lonely woman, who’s acutely conscious that her time for children is limited: a cultural cliche, perhaps, but one that is rooted in deep truth and handled with sensitivity here. She’s the go-getting seducer; Troughton’s Danny is the awkward man-boy with more on his plate than she expects, haunted by things he’s done wrong in the past and unwilling to stumble into further mistakes. Gosh, there were moments when it was absolutely heartbreaking and other moments when I could barely look at the stage for embarrassment on the characters’ behalf. I could say that both the actors were excellent, but that would undermine their achievement: I didn’t really notice the quality of their acting, because they just seemed to be their characters. *This wasn’t a first date. So it’s OK.